Herpesviridae is a family of viruses which cause diseases in humans and animals such as the macaque monkey and the mouse. They can cause recurrent infections due to their invasive action on the immune system. Herpes viruses are composed of two double-stranded, linear DNA genomes which encode from 100 to 200 genes. They are nuclear replicating, transcribing the viral DNA to RNA in the nucleus of the infected cell. There are eight distinct viruses in the Herpesviridae family: Herpes simplex viruses 1 and 2, varicella zoster virus (shingles), Epstein-Barr virus, cytomegalovirus, roseoloviruses 6 and 7 and the Kaposi’s sarcoma associated herpes virus. 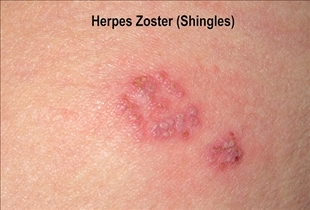 Shingles, or herpes zoster, is a disease caused by the varicella zoster virus. After the chicken pox symptoms fade away, the virus may reappear after a prolonged period of time in the form of shingles. Herpes is a disease caused by the herpes simplex virus type 1 and 2. Oral herpes and genital herpes are the two most common variants. Early symptoms of shingles include headaches, fever and a general feeling of malaise. After that, the infected person experiences a local burning sensation, itching and various levels of pain in the dermatome area. In a period from 2 days up to 3 weeks, a rash will appear on the torso. Some are also localized on the face or other parts of the body. Small blisters appear on the surface of the rash containing serous exudates. They will form a crust within ten days which will fall off and the skin will recover. Symptoms of herpes include headaches, red sensitive area development, fever and muscle ache. Blisters appear on the surface of the red area. They will disappear within a few days to about a week, but the virus isn’t ever completely gone. To alleviate the pain caused by shingles people can use over-the-counter analgesics, antiviral medication and steroids. Lotions which contain calamine can make the itching sensation less painful. Topical capsaicin and lidocaine may be used as well. Antiviral medication will inhibit the replication of the varicella zoster virus. Acyclovir, valacyclovir and famciclovir have proven to be efficient. Corticosteroids can be also used to treat the infection. 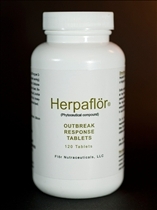 To treat herpes, people can use antiviral medication such as acyclovir and valacyclovir. Topical docosanol is effective in treating herpes occurring on the lips. Methods of alternative medicine such as aloe vera lotions or bee products can also be used successfully. Analgesics like ibuprofen and acetaminophen alleviate the sensation of localized pain. Shingles and herpes are diseases caused by the viruses of the Herpesviridae family. Symptoms for shingles and herpes include headaches, rashes, blisters and local pain. For treatment, people can use analgesics, antiviral medication like acyclovir and valacyclovir, steroids and aloe vera lotions. Which disease is more common?